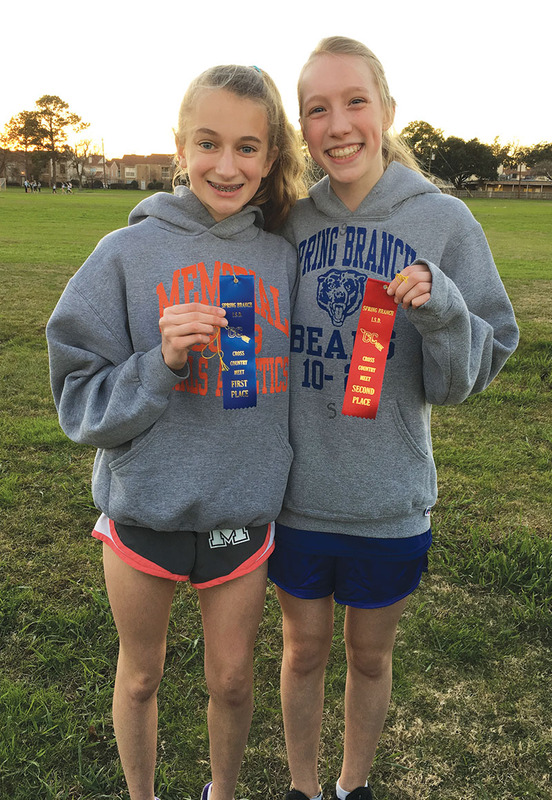 Mary Kate Skrabanek (at left), an eighth grader at Memorial Middle School, took home first place at the Spring Branch District cross-country meet, and Chandler Gartner (at right), an eighth grader at Spring Branch Middle School, took home second place. Skrabanek’s winning time for the two-mile race was 12:42. The course for the first meet was a one-mile race, and the course increased in length throughout the season. Editor’s note: The Buzz congratulates Buzz About Town columnist Annie Blaylock McQueen on the arrival of her beautiful baby Georgia. Annie took a short break to spend time with Georgia and twin toddlers Cash and Lila and will return to the Buzz About Town column in May. In the meantime, associate editor Jordan Magaziner Steinfeld handled this column. As usual, please send your high-res photos and community news to info@thebuzzmagazines.com or 5001 Bissonnet, Suite 100, Bellaire, Texas 77401. Items are published on a space-available basis.